This 4 bedroom family dwelling is currently under construction and due for completion later this year. 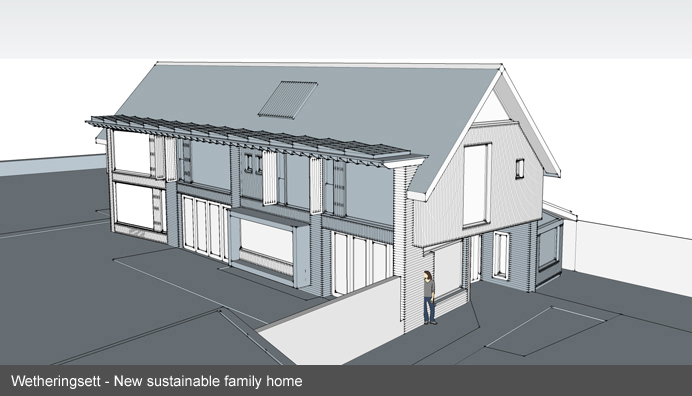 The building forms a highly insulated eco house comprising open plan family kitchen and dining area with adjacent playroom, large sitting room and study space to the ground floor and 4 bedrooms to the first floor. The house is arranged on the plot in order to maximise natural daylight, exploit views to the open countryside surrounding the site and provide a private secure family garden space. The large glazed openings in the building façade are with side balconies, which are concealed and thermally efficient during the winter months but can be opened up in the warmer weather to provide larger openings within the wall to provide natural ventilation and connection to the garden from the sleeping spaces. An oak framed window seat is provided on the south west facing external wall and a curved brick wall at the entrance guides visitors to the front door. The construction details applied to the house result in a home that is highly energy efficient and which significantly exceeds current building regulations. The energy calculations for the property are predicted as band A rated with very low fuel use compared to floor area created.